The article attempts to identify the dynamics and direction of the root plant market development in Poland in the period before and after accession to the European Union by defining resource-efficiency relations related to the cultivation of potatoes and sugar beet. The research was carried out in the years 1994–2016. 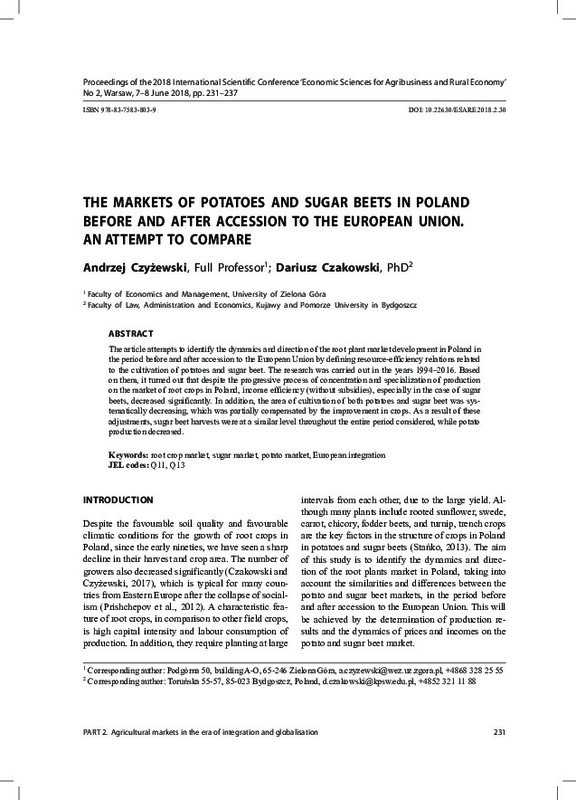 Based on them, it turned out that despite the progressive process of concentration and specialization of production on the market of root crops in Poland, income efficiency (without subsidies), especially in the case of sugar beets, decreased significantly. In addition, the area of cultivation of both potatoes and sugar beet was systematically decreasing, which was partially compensated by the improvement in crops. As a result of these adjustments, sugar beet harvests were at a similar level throughout the entire period considered, while potato production decreased.